In 2005 St Mary’s had an opportunity to work together with South West Youth Ministries to promote the church’s work with young people. 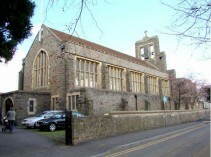 We were unable to raise sufficient funds to enable this work but through a grant from The Temple Ecclesiastical Charity we were able to facilitate this link and fund youth workers from the South West Youth Ministries to work ecumenically in Shirehampton. Outreach included a range of activities; a bible study group for top primary aged and secondary aged children and a youth group with a Christian base for teenagers. The workers also joined our Sunday services and supported the children’s ministry. Annual grants until 2010 enabled us to grow this outreach and, although we no longer have the youth workers, we run a wide range of children’s work, using a large number of volunteers from our church family and other churches locally run other aspects of youth provision. The grants were a huge encouragement to us and supported us in the initial phase of running these things ourselves. We currently have over100 children who attend Christian based events and weekly groups and much of this growth was enabled by The Temple Ecclesiastical Charity – grateful thanks.